A fantastic match considering the cold conditions. Winner on the day, collecting £600, was Ian Wood (Larford) who drew peg 75 on the Specimen Lake. Ian caught on paste at 5m and down his edge to win with 170-11-00. 2nd on the day was Polish rod Przemek Solski who drew peg 10 on the speci burr. 3rd on the day was Fran O’reilly ( Bagem Baits, Rays Tackle) who drew peg 28 on the match. 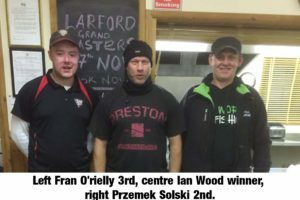 4th overall was Shaun McCarthy who drew peg 42 on the Match Lake weighing 140-11-00. Shaun caught on Method and down his edges. 5th on the day was Paul Cook (Frenzee) who drew peg 26 and caught all day on Method weighing 135-11-00. 6th overall was Max G (PR Floats) who drew peg 12. Max caught most of his on method and a few good carp short on pole. Max weighed 139-05-00.